Have been waiting so long to write on this topic 🙂 but it is never too late to pen it down even now. 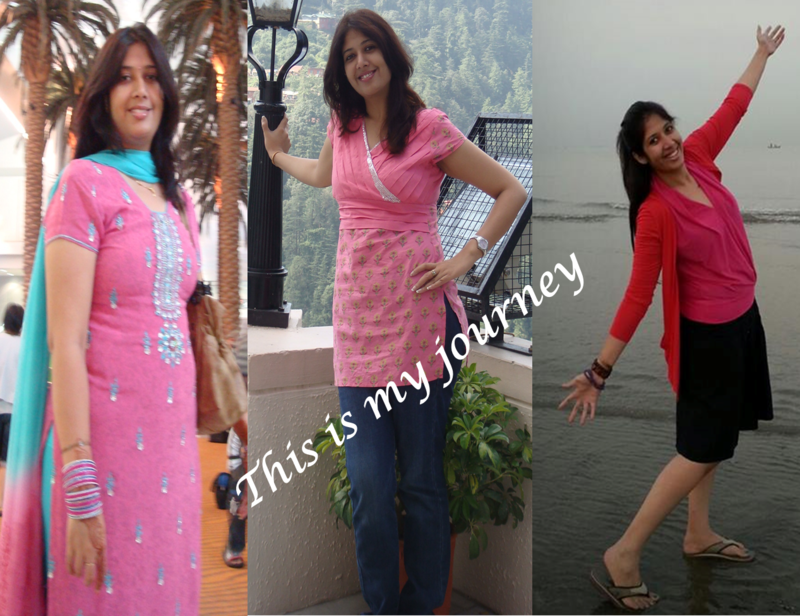 Weight management has been a dear topic for me for last 15 years. Something I have read, researched and experimented myself. We are all born a few pounds in weight and gradually as we grow we keep on putting many more pounds; till one day we realize the few pounds are visible spilling from our clothes. This revelation for some creates an alarm these people take control of their health while for the others we get depressed and start detesting ourselves. This blog is for the latter type , the depressed, over critical, lazy bums who start seeing food as the forbidden apple and still go ahead and sneak a slice of pizza or a chocolate and then beat themselves up. Food is highly emotional , when we are happy we feast when we are sad we binge. Food is an essential part of our lives and one of the ways to share love and affection. In Indian families mothers spend most of the the time cooking for the family pouring all their love in desserts and delicacies 🙂 So we cannot do much about food it will be around us tempting and enticing but yes some changes can be made and most of us have also adapted to healthy eating. I am a certified Pranic Healer and lately I attended a course on Pranic Weightloss and Body Sculpting and was so surprised to learn that excess weight is nothing but energy , it is an energy that is stuck up due to our emotions. It has not much to do with exercise or dieting. Our bodies are completely neutral the way they behave is an effect rather than a cause. What has to be consumed, stored or expelled out of the body is the work of our mind. Let us understand this stuck up energy , we understand that our bodies metabolism and secretions of hormones are controlled through the brain activity , the brain works as a response to our thoughts. Thoughts are broadly divided into Fear based thoughts and Love based thoughts. The cause of excess fat in the body is fear which blocks out love. I know you must be thinking most of the fat people look happier 🙂 but it is an external appearance put up these beautiful people mostly. When we do a session the emotions of under confidence,low self esteem and a habit of constant negative self talk is observed. The fear based thoughts include, shame, insecurity and low self esteem. These thoughts have energy which is contracting and dark grey and this can be felt while scanning. These are really old thought forms that get stuck and refuse to move even with best of diet plan and exercise regime. So your fat is all the anger and hate you have directed to yourself and others. Fat on the hips can be “lumps of stubborn anger at the parents”. Even fat on the thighs can be “packed childhood anger, often rage at the father. Interesting isn’t it? Most of us hold on to fat to mask our insecurities in relationships, work, life ahead etc etc. Our natural state is Love and love is detachment, love is letting go. The energy of love is moving , it is expansive. So whether it is relationships or food if we practice detachment we show love.Obsession for either a person or for any substance happens when we are ready to give and do not know how to receive. We keep holding for more because we do not feel we are getting back the desired response. 2. ‘Mirror’ – Your best friend – I keep hearing my friends and family complaining that I am obsessed with mirrors; and I openly admit I am I deliberately made it a habit to smile and mentally say “I love you gorgeous” when ever I see a mirror. Next time you catch me smiling just like that you will know what I am thinking. This helps in lifting your self esteem. 4.Bless anything that you put into your mouth – Food/Water any edible stuff just mentally bless it, as per Masaru Emoto’s experiment on water thoughts impact our reality so when we bless any negative energy that the food is cooked with or projected with is neutralized and is fortified with nourishment. This pouch has 7 chosen crystals specially to aid Weightloss and emotional detox. This is curated specially for the 21 Days Spiritual Weight Loss and Emotional Detox Workshop participants. The crystals are thoroughly cleansed and energized with personal programming by Sargam. I love ur blog…its gives me a deep satisfaction. .. Thank you for bringing all this info together…andy websites in general you would recommend? and would love the meditation! Thanks your responses are very encouraging!! Thank You. This article totally fits me. I am glad Jill ; wish you all the love!! Amazing article.. even being into fitness and sports for years, never knew that body fat is associated with emotions!! 🙂 Thums up for your fitness achievement. Keep it up! I needed this important reminder as I let go of stomach fat. Thank you! Hey Sargam! Great to have come across your blog on wtloss.Have been on hundreds of yo yo diets to gain all the wt.back..along with lotsa medical issues due to dieting. .Have been into pranic healing on and off…losing faith if it didn’t work out. your blog again ignites the spirit n am ready to head bang on again. Thanks Ritu… what we believe becomes a reality.. all the very best to you !! Your journey seems interesting and I would also like to benefit from it. Kindly share the video clip with me too. your story is inspiring. do you know of a meditation for weight loss? Its new to hear about overweight.i ve also done basic pranic healing course.i really enjoyed reading ur blog.very nice.pls send me weight loss meditation. hi sargam… what a wonderful writing! u lifted my spirit. recently i have done t pranic healing body sculpting workshop. I want to lose my unnecessary weight. enjoyed reading ur blog. would u pls send me the visualization. thanks dear!! i must say, ur writings are very inspiring and thought provoking!! I an immpressed with your website. I want to know more details and follow visualisation meditation. can you send me the meditation? Very informative blog… I am also into pranic healing. Will appreciate if could send me the meditation. Very informative blog…i am also into pranic healing so will appreciate if you could send me the meditation. I am still making few changes will share soon – love! 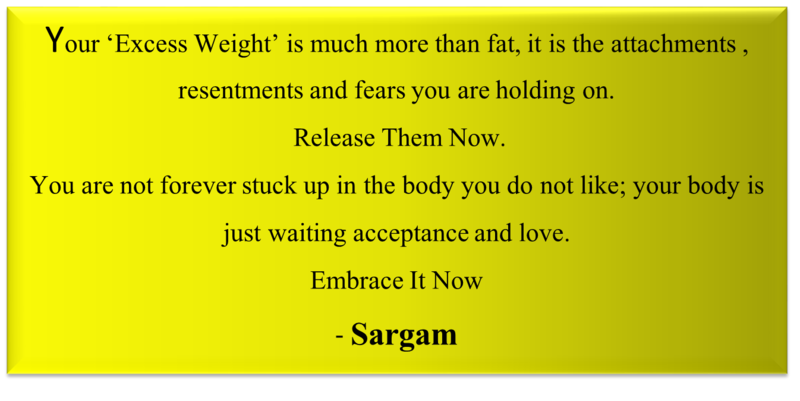 Amazing article dear Sargam, feeling relaxed as truely said, fear, anger are the reasons for weight gain, will try to reduce my anger within me. Getting encouraged after reading your blog. I tried pranic healing for past 6 months. Tried from many healers. But no change in weight loss. Very minimal weight loss which I gained back. Losing my hope. Trued all diets. No use. Atma I wish to see weight loss through you. How to contact and how much you charge per seesion. Already I had wasted enough money for this. So afraid this time.please clear my doubts. Hi Sargam, I am also a pranic healer. Can you please send me the meditation. Thank you. Great work. Am also a Pranic healer..Lovely insight…even I wish to loose 25 kgs..I hv been into wt losing regumies for yrs together..which mostly ended up with depression…hope and am anxious to have a version of wt lose meditation…thanks fr ur grt support…Anxiously waiting fr ur reply..tq..
this is true for all our problems in life and even god 🙂 Moh ko kahan dhoonde re bande mei toh tere pass ….such profound lines. very inspiring , could you share the meditation video. I have attended pranic healing workshops and have faith in it too. May I request for the meditation on weight loss? Thanks for highlighting important issue with such ease. I am your guru bhai as Gp Capt. S.P. Saxena has been my teacher too. I took Pranic healing course for basic, advance and Advance scanning along with Crystal course back in 2005. Though i am not active in pranic heaing clinic however i have been following it for these many years on my family and friends. Please help me with the short visualization meditation on weight lose as i have extra 10 kgs of weight. Also can you give me an insight for body sculpting. Delightful article, I would love to do the visualization meditation. Join me for 21 Days of Spiritual Weightloss and Emotional Detox 🙂 starting April end. I missed the comment here we have already started the program on 9th April with nearly 25 participants. Please sign up on the website http://www.sargammishra.com for updates on workshop and new programs. Thankyou for leaving your wonderful comment . Here is a beautiful for helping with Weightloss. Thank you for your inspirational blog which has made so much sense to me! Bless you and your continued work…. Very moving and thought provoking. I really enjoying reading this post, it hit a lot of personal places for me. Thank you! This is exactly the kind of article I was looking for. I had this innate feeling, but just wanted to confirm it,that my binges and cravings are all metaphysical. I searched the internet for so many days, and finally found someone who validated what my gut told me. Thank you so much! I am interested in this healing. I now realize Im in much need. Please send me an email and provide me with the steps I need. Thought-provoking and informative article, it definitely resonated with me. Thank you! Your blog calls to me. Some while ago I healed myself overnight of some serious pain in my body by identifying the root cause of it and giving my body there love and attention and affirmation it needed. I’ve struggled all my life with my Weight and I am ready to start healing myself. Which is what brought me to this blog. Please send me the meditation too. I will use it well.